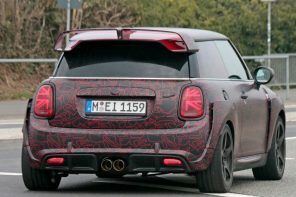 Here at MotorongFile we’re making December JCW month to celebrate five years of the GP as well as discuss the future of the brand. And there is no better way to start this celebration than re-running some of our favorite pieces on the mythical JCW GP over the years. 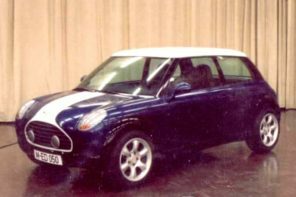 Today we give you the first of three articles from the MF Vaults that tell the story of the most special (new) MINI made yet. We’re going to talk about the details behind the car as well as another epic drive in it. 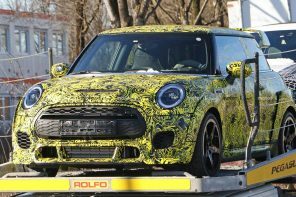 Finally we’ll focus on the future of JCW. But today we want to present our very first full review of the GP as it was posted on MF almost five years ago to the day. 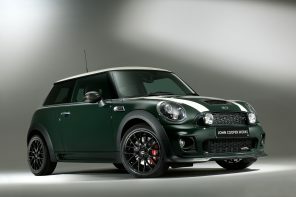 The MINI JCW GP is the ultimate expression of factory performance for the first generation MINI. 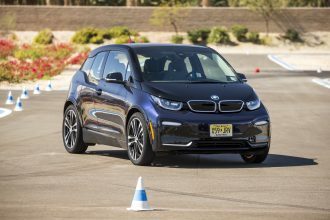 It’s a car that eschews most of the typical compromises to focus on performance both at the road and track. But what’s it like to actually live with a GP for a week? 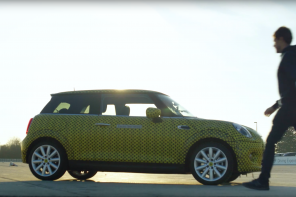 Is it a car that can become part of daily life or does the lack of compromises make it less useful as regular transportation? With all the recent GP reviews over the last few months we thought it was more appropriate for our review to focus on these questions rather than simply the basics covered elsewhere. My week with the GP started with frigid temps and salt encrusted roads. 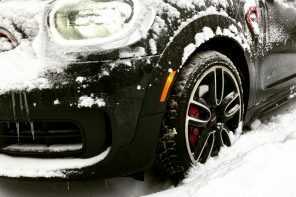 Having driven in winter conditions since I had my license, I was generally prepared for the lack of grip. 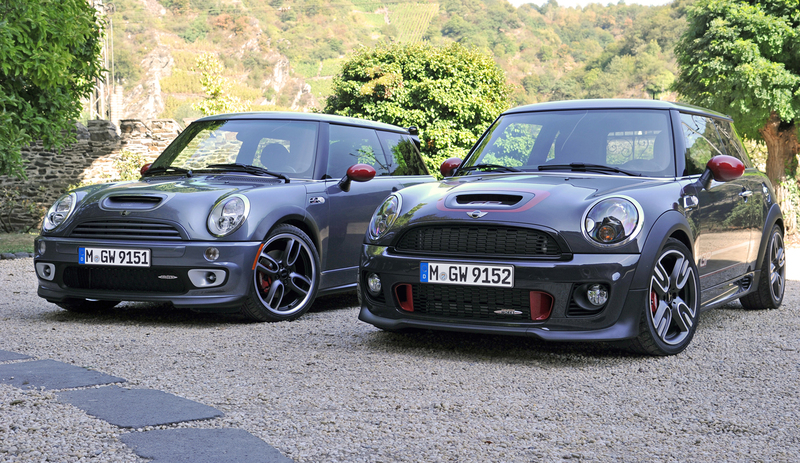 But it’s hard to be truly prepared for the power of the GP if you haven’t driven a seriously modded MINI or JCW MINI. And it was that power that made winter or cold weather driving so interesting and at times fun. But let’s start with the basics. The GP is fast. And the sensation is so exhilarating that, if you aren’t burying the tach needle, you feel you’re letting down the car. It’s almost as if it deserves to be driven like you stole it constantly. The sensation of speed, the sounds coming from the exhaust, there are very few cars that are as immediately fun as the GP. 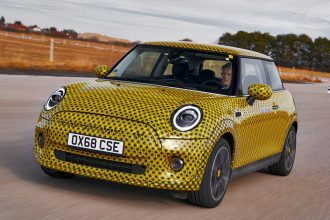 One of the additions (or subtractions depending on how you look at it) was the reduction of sound deadening material in an effort to reduce weight. The affect is more road, engine and exhaust noise in the cabin. This is also helped by the lack of rear seats. 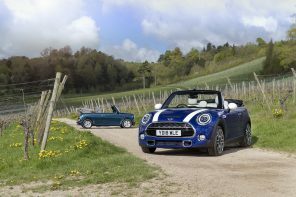 The net result is a car that isn’t quite as road-trip friendly as the stock MC or MCS. It’s not what I could call loud but you rarely forget that you’re driving a narrowly focused performance car. The GP is also quite a bit lower to the ground than the stock MCS. The front air-dam in particular is exceedingly low. In fact I bottomed out several times simply driving on Chicago roads. And the side skirts aren’t much higher. To jack up the GP, you first must open the small “trap doors” on the bottom of the side skirts to reach the jack points. Then you have to insert the supplied orange blocks which effectively lengthen the jack points to protect the side skirts. To make matters worse the GP doesn’t include a standard MINI jack that typically comes with the cars as it would be incompatible with the orange blocks that extend the jack points. 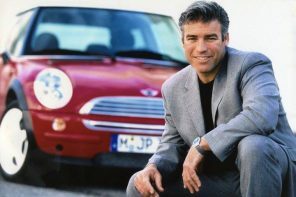 Needless to say fixing a flat should only be undertaken by an experienced person (or BMW dealer) with a low profile jack or an actual lift. It also means getting rid of the run-flats on the GP brings some interesting potential problems should an owner ever need to change a tire on the side of the road. However there is good reason for the GP to be so low. 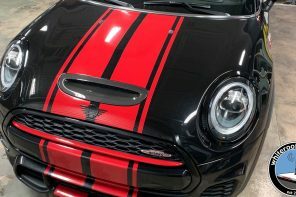 For one it’s equipped with the JCW suspension that has been available as a dealer installed option for several years now. 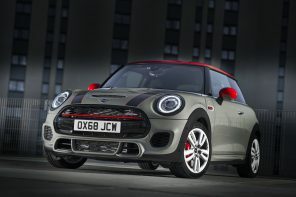 We’ve talked about the JCW suspension kit in the past so we won’t go into details here. However I will say that it is the best compromise between performance and comfort I’ve ever felt. 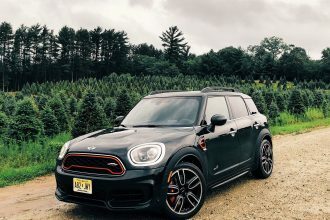 On the performance side, the kit allows the MINI to be better planted in corners not only helping with handling but also significantly improving power delivery from the apex out. 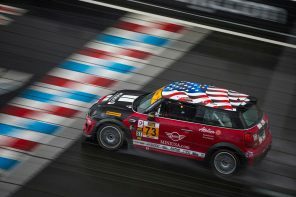 Or in other words it reigns in motion as the result of weight transfer and keeps the MINI better composed allowing the two front tires better grip to apply power out of the corner. 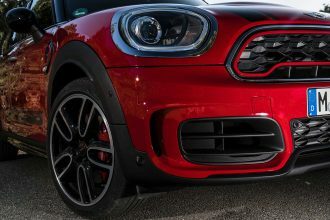 The JCW suspension kit is a welcome addition to any MINI, but on the 218bhp JCW GP, it’s even more helpful in getting around corners faster and getting power to the ground. It’s also probably the most underrated part of this car. 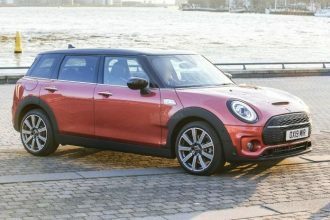 Yet the GP is even lower than the typical MINI equipped with the JCW suspension. This is due to that extremely low body kit I mentioned earlier. But as opposed to most “aero” kits found on cars, the GP’s is quite functional in reducing lift and helping the car feel more stable at high speeds. 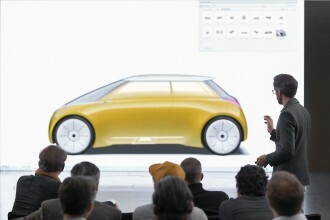 Also part of this equation is the plastic under-tray and rear wing. 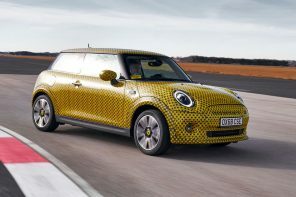 On the standard MINI, BMW didn’t particularly pay attention to the aero efficiencies of what was under the car. 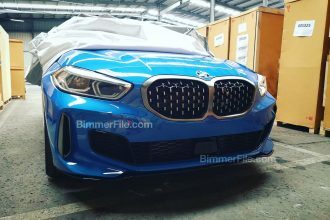 However on the GP, BMW designed two long plastic trays that cover most of what is down there and work with the aero kit to create less lift and potentially more downforce. However even more important in creating true downforce is the radical looking rear wing. Unlike all other OEM MINI wings or spoilers, the GP’s wing is attached to the boot and effectively sits behind the roof. 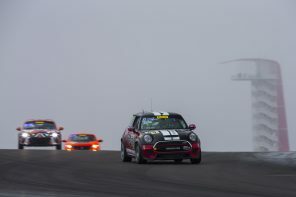 According to sources, this is the result of aero work that showed that position to be more efficient at producing downforce and creating more high-speed stability – something stock MINI has always lacked. 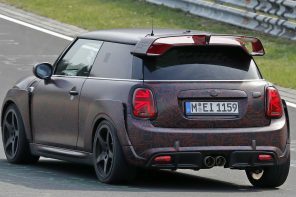 The wing is attached to the rear boot via reinforced molded plastic and the center portion is made entirely of Carbon Fiber. 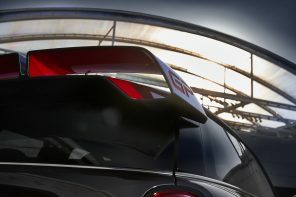 Compare this to the normal JCW wing which is simply plastic with a carbon fiber laminate applied to the top and you start to understand why MINI pegs the cost of a replacement GP wing at over $2,000. 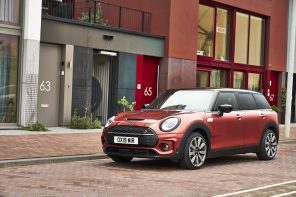 Another GP specific item is the updated intercooler that helps bring the power output up to 218bhp from the standard 210bhp on the 2005 and 2006 JCW MINI Cooper S. And to be honest that even feels conservative. 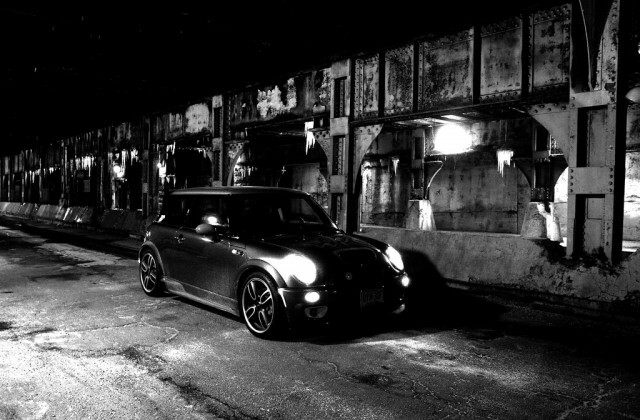 But it’s the way that power is delivered through the power-band that differs from the stock JCW. The GP pulls very strong all the way to and past it’s 7,000rpm redline. 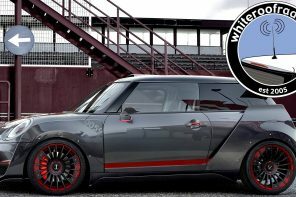 In fact, we heard from several sources that MINI was rather conservative with the 7,000 redline. One wonders what engineers could have done if they had just a bit more time. Surely 7,500 or 8,000 could have been achieved. All this power is put to the ground via some light (19.8lbs is definitely light for OEM standards) 18″ wheels and Dunlop SP Sport 01 DSST. 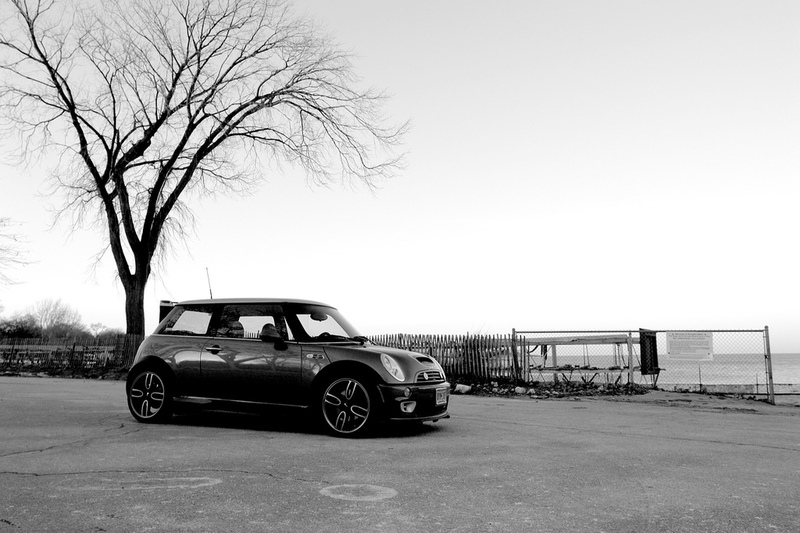 These are the same tires I’ve written about previously on MF having had them on my JCW wheels last year. I won’t go into details here on the tires (since it’s been done before on MF) but I will say that they are generally a solid set of performance tires. They’re great on the street, decent on the track, passable in the rain and deadly in the snow. But the GP’s wheels (internally named R107) are a little more interesting to me. At over 5lbs lighter than the stock S-lites yet an inch larger in diameter, it would seem they offer the best of both worlds – a rarity for an OEM wheel. What that means is they both have great on edge feel (due to the size of the wheel vs side-wall) and give the car an eager feel at turn-in (due to the weight reduction). Both things only found in the aftermarket previously. The US spec GP’s interior is a bit less special than the rest of the car. Due to US airbag standards (specifically the seat sensors that have been mandated since 2005), the US GP doesn’t get the wonderful Recaros that are standard everywhere else in the world. And while the cloth/leather seating is generally good, it’s not up to the excellence of the rest of the car. While the change does keep the price down, the seats tend to let down the car more than they should. Another omission (which the whole world shares in) is the lack of the superb JCW steering wheel. 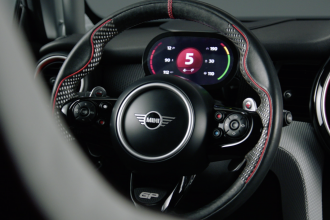 While again cost was surely an issue with this and other potential interior accessories, the addition of the JCW steering wheel would have been a very nice touch. If you’re an audiophile you’ll also be a bit disappointed. Four speakers (all in the doors) do not make for the best sound-system. 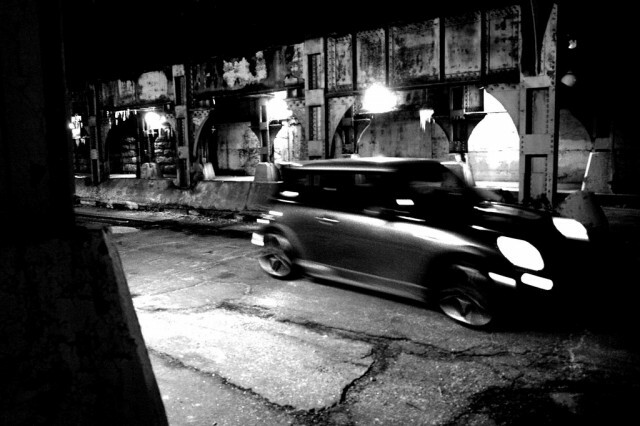 Driving around Chicago on a Saturday night with the latest mix pumping out of four lowly speakers reminded me of driving in my friend’s ’84 Cavalier as a sophomore in high school with no radio and a boombox on the dash. Also a disappointment are stock vinyl shift and ebrake boot gaiters. 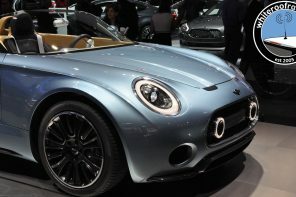 The JCW alcantara gaiters would have been a nice touch to go along with the alcantara/leather JCW steering wheel. 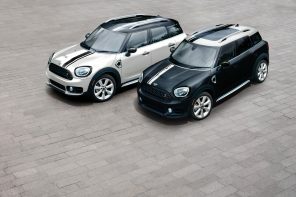 And then to top it off, the JCW leather dash would have been a fantastic addition as well. 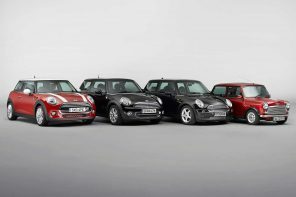 But then again MINI had a price point to hit and surely any dealer would be happy to help you correct these oversights for a price. Of course the real star of the show when it comes to the interior is the lack of rear seats and that shiny bar in the back. While the bar may not be entirely useful in a structural sense, it does help keep your groceries from flying into the back of the seats (all while looking fantastic). Not all that an underrated feature if you plan to use the car as semi-daily transportation. In theory it also gives you a place to anchor a child seat with the provided anhor point. 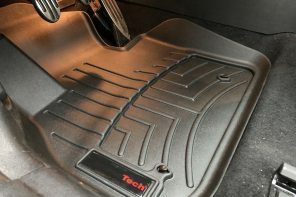 However those looking to use their Schroth Harness for track use, (an activity that this car desperately begs for) will need to lift up the carpeting and find the anchor points below the floor. One thing I noticed about the small additions behind the front seats was the small door that leads to the compartment below the floor absolutely would not stay latched. The very rudimentary mechanism that closes the door seemed poorly designed and not really well thought-out. Luckily the weight of the door kept it from popping open constantly. But small things like this (while somewhat annoying) reinforced the bespoke quality of the GP compared to a standard MINI. Speaking of build quality GP #0317 was not without the infamous MINI rattles. While the main one emanated from the dash (big surprise), more troubling was the odd plastic on plastic rattle from the rear. And without some sound deadening material and any back seats, that rear rattle got annoying very quickly. Another small build quality issue that seemed to be exclusive to all GPs I’ve driven and ridden in was the way you had to shut the boot. By the end of our time with the car we were calling it the “GP slam”. We found the only way to be sure the boot was closed was to (with the boot open) put your hand on the license plate (God forbid you touch the metal!) and then to slam it with just enough force to make you feel uncomfortable. Only when you felt a little worried that you just broke your $32,000 car would it be fully closed. 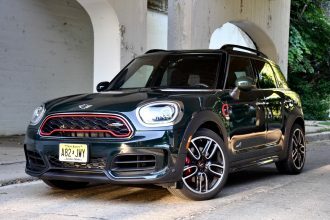 After spending seven days with the GP I came away with three main attributes that (for me) defined it as special over the stock MCS: addicting power all the way to red-line, sublime sounds, and improved dynamics. Now trying to pick one of those three as the single most impressive attribute of the GP is incredibly difficult. Looking at it logically one would have to say that the increased power and dynamics have to be the top two. And choosing between those two would seemingly be easy, right? 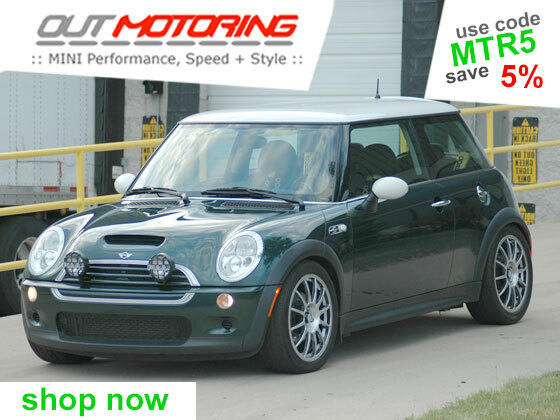 While the increased horsepower is a huge part of the car, on public roads all that power and speed only does so much. At the end of the day the thing I miss most about the GP is the way it handled. 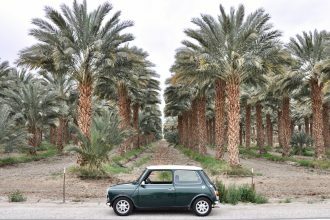 The way it absolutely refused to pitch, roll, squat or dive in hard driving, how it felt utterly planted at speeds that make most MINIs feel nervous was eye-opening. 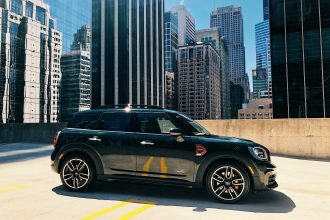 For me the soul of the GP comes down to the aero work done throughout the car, reduced unsprung weight with the aluminum rear control arms, the addition of the superb JCW suspension and the weight reduction that brings it all together. While all this makes for an great track car, what does it do for the general day to day livability of the GP? No, it may not be the right choice for those who need more than two seats occasionally. But for those who can look beyond that, this car does everything anyone could expect of it while feeling and sounding better (and yes badder) than any other factory MINI out there. It’s great with gas (despite the fact that I recorded 16.8mpg in my “rigorous” tests), it fits anywhere and it swallows luggage or groceries as well as a 3 series. 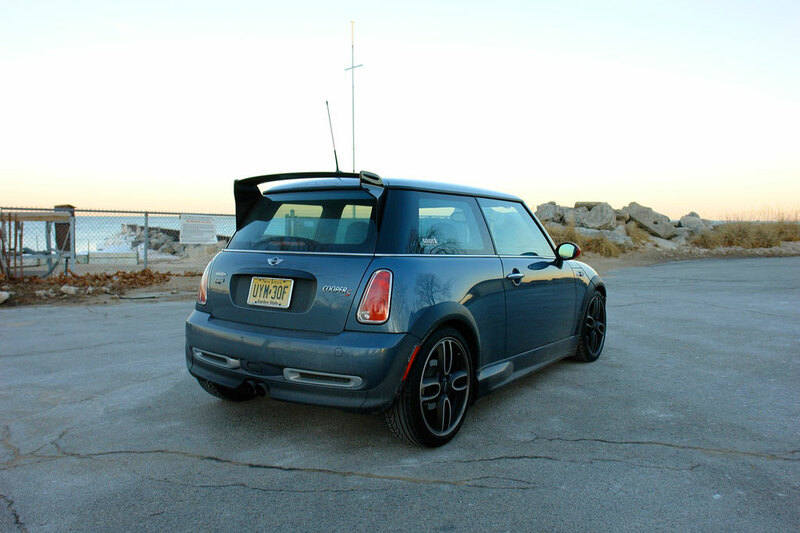 One of the most loved attributes of the MINI is it’s ability to be a great track car while being versatile enough to act as a useful part of daily life. 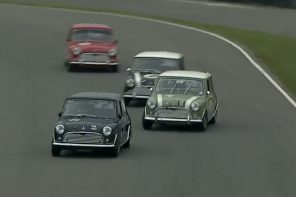 What MINI has done with the GP was to turn the performance portion up to 11 while keeping most of the versatility of the stock car intact. 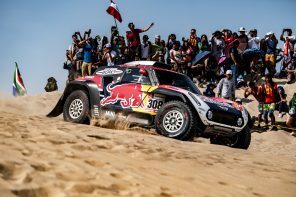 The net result is a truly special car that is hard not to fall in love with more and more each day. Simply put, the GP is the ultimate MINI.